Windlass manufactures Swivel Joints which are metallic pipe fittings with integral ball-bearing swivels. 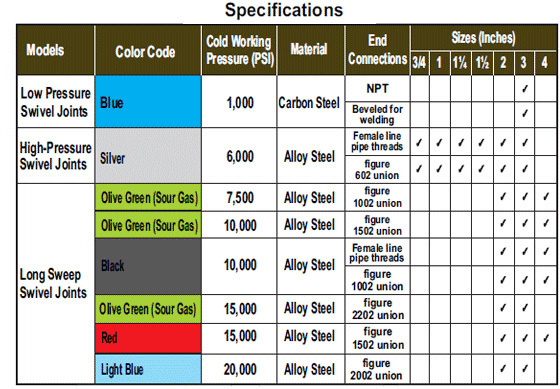 Available in sizes 3/4″ through 3″ for 6,000 PSI, non-shock cold working pressure. All sizes available in eight styles for 360° rotation in one, two or three planes. 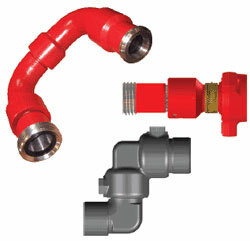 These Swivel Joints are recommended for hydraulic control lines, mud lines, rotary, line connections, BOP lines, test lines, water lines, offshore wellhead connections, cementing, circulating hoses and choke-kill lines.